21/7/08 — Reattribution — Madrid, Museo del Prado — Since it first entered the Prado in 1931 as part of the bequest by Pedro Fernandez Duran, The Colossus (ill. 1) was considered one of Goya’s masterpieces as well as an emblematic painting of a period in Spanish history. Representing either Napoleon, Ferdinand VII, Godoy or war itself, the presence of the giant unleashes the flight and misery of the Spanish people. It thus became a symbol of the war for independence from France. In 1993 Manuela Mena, chief curator of Goya paintings at the Prado, and Juliet Wilson Bareau, an eminent specialist on the artist, had already stated their doubts on the painting’s authenticity and the work was not included in the exhibition “Goya y los años de guerra” at the Prado which closed July 13, 2008. During an international meeting of specialists at the Prado last 23 June, Jose Luis Diez, chief curator of 19th century Spanish paintings, revealed that thanks to a very recent study on the Colossus based on a series of macrophotographies, he discovered in the bottom left-hand corner the capital letters “ A J”, the initials of Asensio Julia’s signature. A native of Valencia in 1760, he died in Madrid in 1832 and is well known today for his portrait with the dedication on it “Goya a su amigo Asensi” (Madrid, Musee Thyssen Bornemisza). The master represented his assistant on the scaffoldings probably during the painting of the frescoes at the church of San Antonio de la Florida. Asensio Julia’s listed works so far today are not very extensive : some portraits, such as the one of his fellow artist and compatriot Jose Camaron y Melia (1760-1819), two battle scenes (Madrid, private collection), The Shipwrecked Passanger signed “Julia”, which the painter donated to the Academia San Carlos de Valencia and a series of gouaches and drawings held at the Biblioteca Nacional in Madrid. 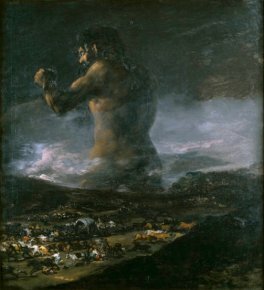 This reevaluation of the Colossus was discussed at length during the Curso de Verano organized from 30 June to 4 July at the Escorial by the Universidad Complutense de Madrid, under the supervision of Manuela Mena and devoted to Goya in the 19th century. Apart from the signature, the rejection of the work from the Goya catalogue is based essentially on stylistic reasons and some awkward features in the execution. Unlike the very clear x-rays of Goya’s authentic paintings, the one for the Colossus reveals several changes during the painting process, both in the composition and in the treatment of different elements. The Colossus itself does not hold up well under close scrutiny nor when compared to the engraving of the Seated Giant (around 1800, working proof at the Boston Museum of Fine Arts) : his arms and thighs are skinny, poorly proportioned as opposed to the enormous back, treated in a loose manner, and generally shows none of the superb musculature inspired by the Belvedere Torso which characterizes the Seated Giant. The mountainous landscape, of no particular interest, rendered in a uniformly somber shade is in sharp contrast to the vigorous mountains, bathed in a cold light seen in the tapestry cartoons, the horizons found in the portraits or even the cupola of San Antonio de la Florida. With the Prairie of Saint Isidoro (1788, Prado) Goya demonstrated his superb talent for painting crowds in a landscape, paying close attention to the detail in each silhouette, to the subtlety of each coloured note. The shapes here are clumsy, repetitive and awkward : the weak donkey stuck in the foreground, the horse with the flanks totally out of proportion and the rider, the herd of bulls running off to the right do not come close to the figures in Goya’s paintings or engravings on bullfighting. According to Jose Luis Diez, the fact that the carriage is a tartana, typical of Valencia ties it to Julia and his hometown. The declassification of this painting, which some had expected and have now accepted, has not been acknowledged by everyone. Nigel Glendinning, a specialist on the relation between Goya and Spanish literature, remains opposed to it and bases his opinion on the provenance (an inconsistent argument as many fake Goyas had excellent pedigrees in the 19th century) and the letters which appear faintly in the bottom left-hand corner of the painting : he insists on seeing rather the number “18” which would indicate its listing in the inventory of Goya’s and his wife’s possessions drawn up in 1812 after she died. Indeed, number 18 lists a “Giant” estimated at 90 “reales”, for which no trace can be subsequently found. Nevertheless, the fact that this reading, even in an old photograph, does not seem very credible, that the signature is in black paint and not red as for the other paintings in the inventory, that the characteristic “X” is missing (see Time (The Old Women) at the museum in Lille) all undermine the second argument completely ; moreover, as if it were not enough, it is now known that some of these paintings bearing the “X” are not authentic. Glendinning also thinks that the composition contains revolutionary, pre-Romantic, elements. Even if the painting is not by Goya and reveals several weaknesses in its execution, the Colossus remains a powerful piece of art which incarnates admirably the tragic crushing of the Spanish people by the Napoleonic armies. Much work remains to be done on the relation between Goya and Asensio Julia. Goya was widely imitated and copied during his lifetime. Hence, acting on good faith, many museums may have acquired works for which it was impossible to know if they were authentic or not. This declassification, follows the brave lead of the Metropolitan Museum who in 1995 agreed to downgraded three canvases, including The Fortress attributed to Asensio Julia by Jose Luis Diez. Other institutions should now ask themselves, in all honesty, if their “Goya” works are authentic.